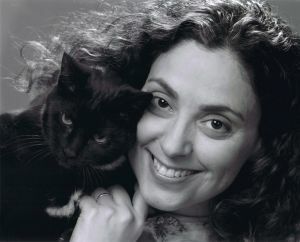 Dr. Sherebrin received her Doctor of Veterinary Medicine degree with honours from the Ontario Veterinary College in 1991. After ten years in practice she became increasingly frustrated with the chronic nature of the diseases she saw in her patients, and the inability to do more for them than suppress symptoms. She began studying Traditional Chinese Veterinary Medicine (TCVM) to address the underlying disorders that produced the symptoms. Dr. Sherebrin became a Certified Veterinary Acupuncturist in 2005, and has completed advanced training in Veterinary Tui-Na bodywork and Veterinary Herbal Medicine. She often lectures to both veterinarians and lay groups, and frequently mentors veterinarians interning in veterinary acupuncture. She is an active member of the American Animal Hospital Association (Scientific Conference Comittee), the Association of Veterinary Acupuncturists of Canada (Ontario Regional Delegate, Chair-Education Committee, Basic Veterinary Acupuncture Course Coordinator and lecturer), the American Holistic Veterinary Medicine Association (Scientific Journal Literature Committee), International Veterinary Acupuncture Association (International Education Committee, Electronic Library Committee) and Veterinary Botanical Medicine Association. When not working or lecturing she somehow finds time for her husband, three children, two cats, and gardening. Travelling to interesting mountainous places to hike is “high” on her list of recreational pursuits; recent trips have been to the Smokey Mountains in North Carolina (Appalachian Trail), the Yukon, and the Negev desert in Israel. She offers integrative health care to her patients, combining the best of eastern and western medicine. Currently she is accepting new patients and referrals at the Secord Animal Hospital in Toronto for integrative health maintenance, as well as integrative illness care. Full hospital services are available on-site, such as surgery, radiography and ultrasonography, dentistry, laboratory analysis, hospitalization, and boarding for special-needs pets. Palliative an hospice care is also available. Patients treated include cats, dogs, ferrets, rabbits and rodents.